Although I’ve been working on and watching some amazing films lately, this year is the first year that I’ve actively paid attention and supported the Storyhive project. In a nutshell, the Storyhive project is a community powered funding program run by Telus in Western Canada that distributes production grants and distribution opportunities for creative people to develop live action and animated short films, web series and music videos. Every year, Storyhive has submission periods for each category and once they’ve been accepted for the $10,000 production grants, voting periods open allowing the individual creators to get promoting for votes via social media as they vie for production grants in each category. Winners in each category receive customized career training and the opportunity to have their projects screened at the Banff World Media Festival. I’d like to focus on the amazing library of female-directed live action short films from this year’s Digital Shorts competition as well as add in a couple of other projects that you may not have heard of. These films are all amazing in their own right with innovative and fun narratives and you definitely be watching them before it’s too late! The first BC entry on this list, this one is a hilarious cringe-worthy comedy about the situation one woman, Rudi, finds herself in post-breakup. It’s about her journey to find closure. Where to see it: It’s available on Storyhive online and for Telus subscribers on Optik Local on your Telus box at On Demand->TV On Demand->Optik Local->Storyhive Winners->Short Films by Female Directors for a very limited time so watch it before it’s too late! A cool concept for a short film rarely seen today, I Phub You tells the story of timid Kurtis struggling to connect with people in our technology obsessed world. After an incident leaves his world silent, he discovered what it means to truly connect with someone. A captivating mystery, Nightwalk focuses on Aatisha who makes an eerie discovery walking home one night: a memory card full of photos of her. The hunt is on to discover who’s been following her and the truth is more than she bargained for. You’ll love the twist at the end! Directed by seasoned horror actress Ariel Hansen, two girls recite a poem over candlelight during a sleepover that invites a mysterious stranger offering a gift-for a price. It’s 5 minutes of suspenseful horror that you’ll want to watch over and over again! After mysteriously acquiring powers that allow her to control static electricity, Alex struggles to learn how to utilize them when faced with a crowd of bullies. Help from an unexpected source leads her to realize the full potential of her powers and how to move forward. For a 9 minute film, I loved the super power effects on this and I appreciated how it reminded me of Lincoln Campbell from Agents of Shield! Jenny and Tim share a slice of chocolate cake during their first date and imagine through a series of flashforwards what it would mean for them to put themselves out there and take a chance on love. A sensitive look on how taking a chance with your heart can be a reward within itself, it’s definitely the most thought provoking film in the library. This one isn’t a short film but rather the pilot episode of a hilarious web series where after 6 months of an experimental, open relationship 24 year old lesbian artist Rita discovers herself pregnant by 25 year old straight filmmaker Adam. The pilot does a great job of establishing the awkwardness and the humor in the situation along with the fear that comes with the ‘what now’ scenario. Where to see it: It’s available for Telus subscribers on Optik Local on your Telus box at On Demand->TV On Demand->Optik Local->Storyhive Winners->Web Series Pilots for a very limited time so watch it before it’s too late! Runaway teens Charlie and Lara crisscross across BC in a drug fueled bank robbing spree after being taken in by a cult-like family. Indebted to the charismatic leader/crime lord Donovan, they must rob three banks in three days while deciding if they can trust disgraced cop Andrew Boone as the third member of their trio on this crime spree. The film establishes the suspense and tension right away while leaving you wondering what will happen next. It’s an older entry into the Storyhive library but it delivers just as much as the newer films. Where to see it: It’s available for Telus subscribers on Optik Local on your Telus box at On Demand->TV On Demand->Optik Local->Storyhive Winners->Past Winners for a very limited time so watch it before it’s too late! These great stories and amazing short films definitely deserve recognition and I thought I’d do my part in making sure they reach larger audiences! Stay tuned for more on film and TV publicity campaigns, new projects, film festivals, travel/tourism projects and other news! After seeing some great lists, chock full of ideas to help boost creativity, I thought I’d share my own list of great tracks, books and movies that help me get over writer’s block to close out 2016. Whether I’m writing copy for a new website, crafting a PR release or working on one of 30 different fan fic stories in different fandoms I’ve got going on, I can sometimes get stuck on writing the next sentence or get boggled down on trying to edit as I go along. These are the artists, the films and the books that have helped me get out of that rut for years. So, without further ado, here’s the list to close out 2016. One of the best-if not, the most underrated tracks off Lifehouse’s debut album, 2000’s No Name Face, this is a song that’s been a positive influence for over half my life. Every time Jason sings, ‘fulfillment to their lack of strength, at your expense. Left you with no defense, they tore it down. And I have felt the same as you, I have felt the same as you,’ I’m reminded that I’m not alone, that he understands, that he’s always understood and that no matter how stuck you think you are, no matter how hopeless things seem, there’s always a way out and for you to be strong. I’d say this film is probably the most poignant and inspirational film of Will Smith’s career. As a lifelong fan of his from his Fresh Prince & DJ Jazzy Jeff days, the one sequence that really spoke volumes to me is where he’s sitting inside the subway station bathroom with his son, tears pouring down his face as strangers pound on the door, not realizing that he’s in fact living with his son in the bathroom. It’s an amazing movie, a reminder that we all have the strength to keep us going, no matter how exhausted we are, no matter how hopeless things seem. It shows us who we really are and what we’re truly capable of. As a long time fan of Michael J. Fox and his sense of humor, this is the ONE biography that I’ve read in recent memory that can make me laugh and make me cry all in 200 pages. As I was reading, I could honestly hear him actually saying the words inside my head, like we were having a conversation. It follows the days after his departure from the amazingly awesome Spin City in 2000 after he made his Parkinson’s diagnosis public and how he founded the Michael J. Fox Foundation. It’s a great read-inspirational, hilarious and heart breaking all at once. As a major fan of his mother Anne Rice’s The Vampire Chronicles, I picked up Christopher Rice’s debut novel on a whim and I was automatically sucked in. Every time I crack it open, I find myself getting sucked in again into the tragedy, the love, the coming of age and the darkness that can come from growing up, growing apart and realizing things about yourself that you never knew were there. The four central characters of Stephen, Meredith, Greg and Brandon and the one outside observer who comes home in Jordan really craft a recognizable and relatable journey. The fact that it’s set in New Orleans, a city that’s historically been divided by money and class and yet finds itself floating on water that could wash it all away is both poignant and fitting. I can’t recommend this book enough. Track #14 off of the debut solo album of Linkin Park’s rapping maestro, the incredible Mike Shinoda; this track forces you to sit up and listen, to fight for what you believe in and to not let ANYONE and ANYTHING hold you back from doing what you want to do. As someone who has been beat down, belittled, discouraged and actively disrespected when it comes to what I love, this song absolutely gives me the strength to power through all of that and everything ahead of me. I do what I do because I believe in what I love and that’s all there is to it. Special shout out also to the first single “Remember the Name” and “High Road”-a great collaboration with the multi-talented John Legend. As a freelancer and a long time customer of Boston Pizza, I’d heard great things about Jim Treliving’s biography and ended up getting a copy as a birthday gift. It chronicles the story of how Jim went from being an RCMP officer to owning the first Boston Pizza and the decisions that he’s made every step of the way as a business owner. What I learned from Jim is that every decision is neither good nor bad, it’s simply a decision. What influences whether it’s a good or bad decision depends on the situation that happens next. Definitely pick this book up if you’re struggling and stuck on where you want to go next for your projects or your business. I love the case study of the risk Jim took during Expo ’86, makes me wish I could’ve been there myself to support him. Continuing some of the themes from his debut novel, the characters in his sophomore effort, this time in college, definitely discover some really harsh truths about themselves and the people around them. Certainly the desire to feel valued, to be accepted, to find those like you definitely plays a part in the story but the climax was totally delicious. I’d say every time I pick up this novel, t forces me to dig deeper and get down to the bedrock of what I’m really looking for and what I’m willing to do. Yet another one on my list that I can’t recommend enough. As a huge part of the musical fabric of my childhood, Boyz II Men’s soulful R &B harmonies permeated my earliest memories, thanks in large part to my brother’s influence. Today, I still listen to them when I’m looking for a particular musical feel while working on a story, trying to let go of a less-than-ideal relationship or looking for inspiration. This track, found on the Prince of Egypt soundtrack (still one of my favorite animated films, by the way), really exemplifies the journey that we all take to get to that destination. Maybe that destination is a new home, a new job, embarking on higher education or trying to build a healthier life, free of substance abuse and negativity. Whatever it is, the boys always tell me that I’ll get there, no matter what. You have to have faith and believe, no matter the twists, the turns and the obstacles-there will always be a way. To close off the list, I’ve got a track off of the band’s 2005 self-titled album. This track is like the one close friend that we all have, the one that we love more than family. When your world is falling apart, when you’re at rock bottom and you’re in the worst pain imaginable, that friend will be there. They may have some hard truths and tough love and choose to force you to see the light rather than just paying lip service, but they love you nonetheless and they’ll never leave you. Once again, Lifehouse is one of the biggest musical influences in my life and I carry every one of their albums with me, no matter where I am. Here’s to a great 2017 to everyone and a Happy New Year! I’ll be returning with some great posts on how PR works in film and insights on new marketing tools! 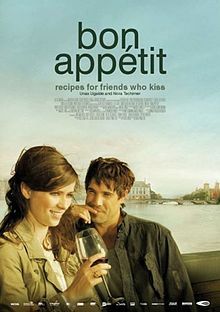 Walking into Bon Appétit on Saturday night, all I knew about the movie was that it was set in a restaurant and it was a romantic comedy of sorts. Though I normally abhor romantic comedies of any sort, I thought that seeing a romantic comedy in another language would be different and less cliché than in English. I believe that movies in other languages, whether they are romances or not, have this ability (in my mind) to make emotions and situations seem more raw and realistic than in most English films (though there are exceptions to that rule). As I saw the trailer for the movie in German and a synopsis that I’d read seem to claim that the movie would be in Dutch, I fully expected the movie to be a foreign language of some sort with subtitles. I was surprised to discover when the movie started, that only a few conversations here and there were in Spanish and German, the rest of the dialogue was in English. Given the movie was set in Switzerland it wasn’t a leap to expect that many people, especially the main characters who worked at a prestigious restaurant in the heart of Zurich would be fluent in English. I was hooked into the story from the beginning. A young ambitious Spanish chef named Daniel leaves Spain for the opportunity to work for the prestigious Thomas Wackerle in his famous restaurant in Zurich and he looks at this opportunity as his ticket to make something of himself in the restaurant industry and make a name for himself. In the beginning of the film, Daniel comes across as someone who has made career ambition his single priority in life. He puts off responding to his girlfriend back home and puts the brakes on her idea to move with him to Zurich. To Daniel, coming to Zurich clearly means no distractions for his career. Due to his talent, Daniel quickly rises in the ranks at Thomas Wackerle’s restaurant and works alongside Thomas’s right hand man, Hugo and sommelier Hanna. Daniel is instantly attracted to Hanna and discovers, while on a walk home, that they share common ground. After expressing his belief that life isn’t like romance films, Hanna kisses Daniel; which proves to be a turning point, not only in his relationship with her; but in his focus. Despite learning from Hugo that Hanna is in love with Thomas and has been in an affair with him for a year, Daniel continues to bond with Hanna. One of my favorite scenes happens in the first half of the movie when Daniel visits Hanna at her apartment and she challenges him to cook dinner for them using only two eggs, some pasta, an orange and some mint candies. The end result is nothing short of amazing and it honestly made me wish that I was as talented and creative with food. What was more significant in that sequence, I thought was the fact that Daniel and Hanna talk on the phone the entire night as Daniel walked home. And at the end of that sequence, at 5 in the morning with the sun rising, Daniel stands and describes the mood of the city with Hanna listening intently. To me, it was one of the defining moments that illustrated how strong their bond with each other really was. The situation comes to a head as Daniel, Hanna and Hugo go a road trip that eventually sees them end up in Daniel’s hometown in Spain, where he is finally (and literally) forced to confront the loose ends of his past in the form of his ex-girlfriend. It is then that we as an audience start to see Daniel grow up and take responsibility for his actions and even start to grow into his own. However, the situation after the road trip quickly deteriorates and culminates in Hanna returning home to Munich and Hugo verbally berates Daniel on the street outside the restaurant for still being afraid to take a leap of faith and do what he really wants with his life. After some soul searching, Daniel patches things up with Hugo who once again encourages him to take a leap of faith; which leads to Daniel going to Munich to visit Hanna. It is there that we finally see Daniel grow into a mature, selfless person capable and willing to go after what he wants and also willing to let go of his single-minded career ambition. In the end, Daniel finally realizes that to grow in life is to take risks and make changes. I won’t spoil the ending, all I will say is that it isn’t a happy ending in the traditional Hollywood sense. All three of the main characters who met and experienced growing pains together at Thomas Wackerle’s restaurant found their own paths in life and yet, they were still connected to one another. One of the biggest reasons why this film speaks to me in a way that no other so-called romantic movie ever has is that it is realistic. Just because you feel a certain way about someone doesn’t mean that your place is with them or that your own dreams are any less important. There are times that it is much more important to let go and be willing to explore, find out who you are, what you want and where your place is in the world. And that, to me, is real life. Even more importantly, the movie sends the message that although we all have our own paths, the bonds we forge and the connections we share are just as vital and as strong as they ever have been; and physical distance can’t change that.